Throughout 2018 preseason camp, returning VolleyMob All-Americans, other key players and even some coaches will be giving you an inside glimpse into training camp at their respective schools. They will introduce us to their teams, share about drills, excitement for the season and more. Thomas was a VolleyMob Honorable Mention All-American at middle blocker in 2017 after averaging 4.61 points per set, downing 4.00 kills per set at a .360 clip and adding 0.91 blocks per set and seven aces. 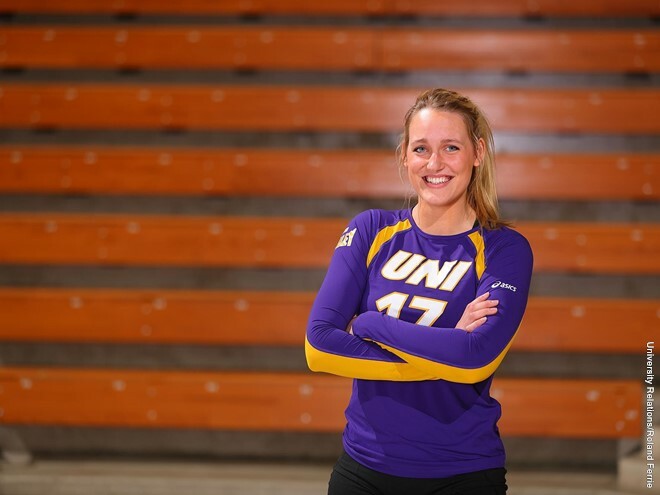 The three-time Missouri Valley Conference Player of the Week joined the 1,000 kill club after posting double-digit digs in 33 matches, including 20 or more six times, while leading the Panthers to a 27-9 mark and NCAA Second Round appearance. The All-Missouri Valley first team honoree tallied five or more blocks nine times, including a season best 10 against Illinois State, rounding out a double-double with 28 kills and no errors, while hitting .563. Thomas earned Volleyball Player of the Week honorable mention honors on September 26. Today was the best day of my last summer. I was able to spend it sprinting back and forth between the trampoline and stock tank pool in my parent’s back yard with my little sister, making up gymnastics routines in the grass, and giggling about misplaced summersaults and cartwheels. When we were finally tired, we floated in the pool and ate ice-cream sandwiches in the water. UNI volleyball training starts next week, but when will I have the opportunity to eat ice cream with my sister in the pool again? She’s going to be a high schooler this year, and who knows how many more days I get to have like this. I don’t want to be depressing, but in a week I will be heading into my final season of volleyball. Every year the anticipation for the first day of practice builds up in the first days of August. Each year has brought a different type of anticipation. If I think back, my freshman year was just pure excitement, being able to finally join my team and be a part of a college program was a dream that was finally coming true. The next few years brought a different type of anticipation with the wisdom I had acquired from previous seasons, along with the added weight of increasing responsibility that a returning starter feels, but this year, right on the brink of my senior season, feels completely different. Everything I have worked for in the last 10 years has been leading up to this final season. The idea that this is the best I will ever be at this sport sits in the back of my mind, but for now I sit in the water and let ice cream melt on my fingers and laugh until my side hurts with her. In a week I will be in practice for more than six hours a day, facing one of the more intense periods of our training. Two weeks from that I will be headed to Los Angeles with my teammates, 1800 miles from northeast Iowa and home, competing in the opening weekend of my last season. I could have blinked and missed the last three years. They flew so fast, but this season I am going to try to soak in every single moment I have left, including days like today.